I provide a professional, high quality family history research service to help you discover your ancestors and build your family tree. As an established expert in genealogy I have been providing my family tree research service to the public for many years at affordable prices. Find your ancestors with Jane Hewitt, Family Tree Researcher! 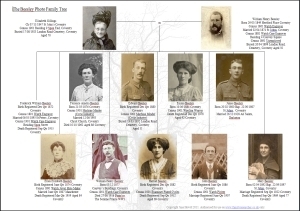 As an experienced professional Family Tree Researcher / Genealogist I can research your ancestors from any region of England, Scotland and Wales, providing all available personal details for your family tree. I can supply birth, marriage and death certificates. I can search the surviving military service records for World War One. Were you adopted as a child? I can help adoptees trace their birth families and discover their family trees. I provide my Family Tree Research service to ex-pats living anywhere in the world. If you have ancestors / relations who emigrated to the USA or Canada I can search for them, tracing their passage and new lives in the New World. Convict in your family tree? I can also trace records for many of those transported to Australia. Did your ancestors run away to Gretna Green to marry? I can check available records for you. Want to see how much money your ancestor left in their will? I can search the index for the national probate calendar for you. If you have one or many ancestors from Coventry or Warwickshire, my specialist local knowledge can be invaluable, saving you many painstaking hours of research and expense. If you wish to research your ancestry for yourself, I can provide expert guidance to get you started in this fascinating field. Concerned about hereditary health problems? I can research your medical family tree to find out about your ancestors' health. You can then inform your doctor of any relevant medical information uncovered about your ancestors. Click these links to place an order, or for more information about my family tree research services, or my additional genealogy services such as certificate ordering and historic photography. For a free personal consultation, please contact me. Flexible payments - see below for details. To see examples of my work please visit my Family Tree Research page. I produce a variety of family trees for customers, including traditional family tree diagrams, photo family trees, bespoke ancestry diagrams and family tree charts. I even collaborated in the research and production of a lengthy, personalised family history book intertwining local historical news with stories and events from family lives. Why use my genealogy research services? Approximately 30 years ago I began drawing up my own family tree, and caught the ancestry bug! My family tree now spans five centuries, and stretches across England, Scotland, Wales, America, Australia, Canada, the Bahamas and Brazil. Having been so successful, I decided to offer my services as an ancestry researcher tracing family trees for other people. As an experienced genealogist / family tree professional I have undertaken extensive ancestry research projects from the 1600's onwards using national and local sources. I am a member of the Coventry Family History Society and I have traced literally tens of thousands of ancestors. Being amongst the very first UK family tree researchers to provide an affordable online research service for the general public, my skills and experience in this field make me stand out from the crowd of genealogist websites which began popping up years later, sometimes bearing similar designs or wording to my own original work. As an established genealogist I have written and published a genealogy reference ebook available from online booksellers. 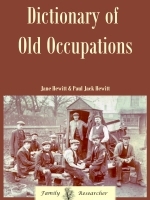 This helps family tree researchers to make sense of the array of old occupations and similar terms found in their family trees, on census searches and in historic documents. From time to time I have been able to reunite long lost family members. These moments are emotional and precious, and by far the most rewarding aspect of my family tree work. I enjoy nothing more than tracing an elusive relative or ancestor. If you would like to know more about your family, get to know your ancestors and more about their lives, if you are asking yourself "Where can I find a family tree professional to trace my family tree" then I am the researcher you're looking for! For further information on the professional services I provide, and the growing list of countries I am able to research, please read my family tree page. To see what previous customers have said about me, please read my family tree testimonials page. I am happy to work either on a 'pay-as-you-go' basis, or for a fixed price. Check out my price list for further details. An important difference between my family tree gold package and top price research packages from many other online family tree researchers is that if you want me to I routinely include information about your ancestor's siblings (brothers and sisters) in your family tree. The extra detail helps to paint a fuller picture of your family members in times long gone. It gives you a better understanding of your ancestor's family lives than simply listing parent after parent. In other words, you receive more for your money and a more complete family tree. If you wish to commission a large research project into your family tree, I can accept payment by instalments over an agreed time period, please contact me for details. For your convenience I accept payment by cheque, credit card or Paypal. If you prefer the reassurance of paying by credit card then you will be pleased to know that I can accept secure credit card payments via my website. Not all family tree researchers offer this facility. Simply use the 'Buy Now' buttons on my price list to make a credit card payment. You do not need to have a Paypal account in order to use your credit card. I also offer family tree gift certificates, so you can buy a Family Tree present for a friend or loved one. I wrote my Family Tree FAQ to answer some of the frequently asked questions I receive about genealogy and ancestral research. If you have questions about my research services, you may find my family tree FAQ useful. However, if you are interested in my help to trace your family history, please do not hesitate to get in touch. Click here to email me directly. I update my Family Tree Researcher web site with news and additional information as regularly as possible. My family tree news page will keep you informed about new and updated information added to the website, as well as local history and some of the interesting genealogy / family tree research projects I have been working on. I hope you enjoy visiting my family researcher web site, whether as a prospective customer or as a fellow enthusiast making use of the local history and free family tree information and reference materials I have researched and published here. Happy researching! - Jane Hewitt. You can find a selection of useful free family tree research resources here on www.familyresearcher.co.uk, which I provide to help amateur family tree researchers and enthusiasts save time and money researching their own family trees. My free family tree resources include a dictionary of old occupations so you can look up the meaning of job titles found in census records uncovered whilst researching your family history, a collection of genuinely helpful free census sites you can access online, and lots of local historical records to assist anyone with ancestors from my part of the country. See my free family tree resources page for the full list. Follow this link for family tree gifts. If you are interested in conducting your own research, I recommend a good book to get you started. From the makers of the award-winning BBC series and Dr Nick Barratt, the UK's leading authority on family history, comes the definitive, must-have guide to researching your family's roots and bringing your family history to life. Containing all you need to know whether you're a novice or more experienced family tree researcher. Covering all access levels, from new family tree researchers to the more experienced genealogist, the Encyclopedia of Genealogy is a comprehensive master class in solving the mysteries of your personal heritage, tracing your ancestors and building your family tree. Jane Hewitt is an experienced, professional family tree researcher and genealogist providing full ancestry research services at competitive prices.